Pull-out airers are perfect for maximising space in your home. These clothes drying racks can be fitted anywhere in the home and some of our airers can be suitable for outdoor or indoor use. 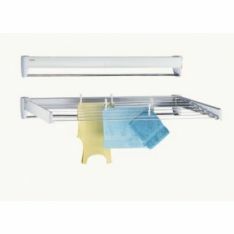 The Leifheit Wall Mounted Dryer Teleclip 60 offers 4.20 metres of drying space and it is ideal of a single person wash. The Leifheit Telegant 100 Tidydry Clothes Airer offers 7.20 metres of drying space and it comes complete with the necessary dowels and screws. Our Minky Over Bath Airer is also perfect for space-saving. This airer, part of our A-frame airers range, can be adjusted to any sized bath and it offers 9.5 metres of drying space. It features grips that secure the airer to the bath to prevent collapsing when it is being loaded. Rotary clothes airers are also in stock at Ironmongery Experts, suitable for outdoor use. We store various Hills Airdry airers, Hills Portadry airers and Vileda Supadry clothes airers. Our Vileda Supadry 4 Arm 60m Rotary Clothes Airer is a weatherproof airer with strong steel body, which features a highest line of 230 cm when fully raised and lowest line of 213 cm. Among our sundry items selection, we also store various fittings and hanging rails for wardrobe rails and shower curtain rails. Within this collection, we have available brass hanging rails, towel rail ends, wardrobe rail centres, wardrobe rail sockets, towel rail centres and chrome hanging rails. Lastly, we stock a wide range of screws varying in size, suitable for a large selection of jobs.